In the Soviet Union, ideology was used to legitimate power. For this reason, political authority in the USSR was always closely linked to ideological doctrine. This doctrine was based on Marxism. As a philosophical theory, Marxism represented a particular type of socialism. Its founders were two German philosophers, Karl Marx (1818–83) and his lifelong friend and collaborator Friedrich Engels (1820–95). In the course of several decades, starting in the turbulent 1840s, they had constructed a huge and comprehensive philosophical system. Their ideas were first presented in a systematic form in 1848 in the celebrated Manifesto of the Communist Party. They were then developed more thoroughly in the three volumes of Marx’s Capital. The intellectual roots of Marxism included the eighteenth-century Enlightenment, classical economics, utopian socialism, and German idealistic philosophy—in other words, some of the main traditions of Western thought. Most importantly, Marx and Engels tried to find a rational formula that would sum up the evolution of humankind and indicate the course of its future development. One of the key elements of their theory was the idea of the natural-historical character of social development. The essence of the theory was that society developed in accordance with its own intrinsic laws. The laws of social development were no less objective than the laws of nature. For this reason, each social formation appears only then and there, when and where appropriate conditions have matured for it. It subsequently gives way to a next formation when that new formation has been prepared by a different set of objective and subjective conditions. In this sense, Marx presented social development as a natural social-historical process. Similar to organic nature and living organisms, social systems are conceived, develop, and pass from one qualitative stage to the next in accordance with certain objective laws. The second fundamental Marxist principle in the explanation of the historical process is materialism. Idealistic philosophical systems believe that consciousness determines existence. By contrast, materialism looks for objective foundations of consciousness itself. It finds them in the material life of people, in their concrete social conditions. 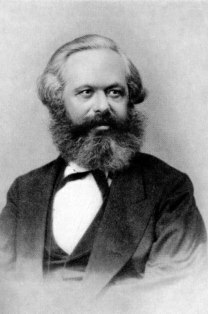 Materialism led Marx to discovering an economic base of society in the form of the mode of production. He argued that the mode of production of the material means of existence conditioned the whole process of social, political, and intellectual life. It was not consciousness that determines existence; on the contrary, social existence determines consciousness. The mode of production or relations of production of the same type generate similar sociopolitical structures and even ideological forms. By using this approach, Marx singled out five socioeconomic formations: the primitive type of society. slavery, feudalism, capitalism, and communism. The capitalist stage and the capitalist mode of production and exchange were described and analyzed by him most exhaustively. Marx’s main conclusion from his analysis of contemporary capitalism was that the bourgeoisie would be unable to control the rapid expansion of the productive forces unleashed by the capitalist mode of production. In addition, the bourgeoisie would completely antagonize the proletariat by driving it to utter destitution and poverty. On the basis of his analysis, Marx drew up the conclusion that capitalism was, inevitably, heading for self-destruction. He predicted that anticapitalist revolutions would occur in the most developed capitalist countries. The current phase of history would be terminated by a proletarian revolution. It would abolish the minority rule of the bourgeoisie and also do away with individual property as the economic foundation of its political power. Humankind would enter the era of communism with a workers’ government running society in the interest of the majority of society.